Wilfrid Lawson was a reknowned British character actor. He was born in 1900 in Bradford in Yorkshire. His film debut came in 1931 in “East Lynne on the Western Front”. In 1936 he made a film in Hollywood “Ladies in Love” with Loretta Young, Simone Simon and Tyrone Power. His film highlights include “Pgymalion”, “Jeannie”, “The Prisioner” and “The Wrong Box”. He died in 1966 in London. A scene stealing actor of lugubrious countenance, Wilfred Lawson (born Wilfred Worsnop) made his debut on the stage in “Trilby” at the Pier Pavilion in Brighton at the age of 16. 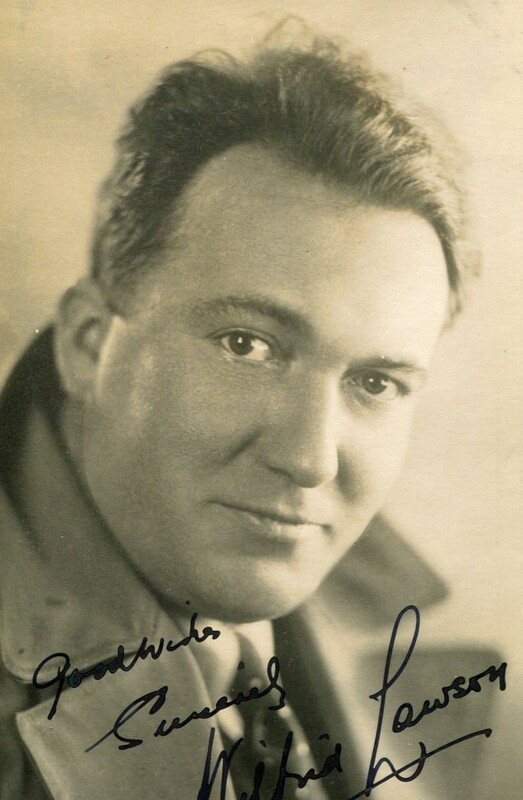 He served as a pilot in the RAF during the final months of World War I, before resuming his theatrical career, becoming a well-established character player by the end of the decade. Wilfred went on to perform at the West End in “Sweeney Todd” in 1928, followed by “Pygmalion” and “Major Barbara” at the Prince’s Theatre in Bristol. He appeared infrequently in films from 1931, but was not considered for leading roles until starring in the Edgar Wallace crime caper The Terror (1938).That same year, he recreated his part of Alfred Doolittle in Pygmalion (1938) for Gabriel Pascal‘s popular film version, and thus attracted the attention of Hollywood. After a brief sojourn in America, Wilfred returned to Britain and was cast in the titular role of a Technicolor biopic, The Great Mr. Handel (1942). After that, he reverted to form playing the eccentric or maniacal character parts, in which he truly excelled. Unfortunately, he was plagued for most of his remaining life by severe bouts of alcoholism, which affected his work. In spite of this, and though he became known as ‘the king of the dramatic pause’, he rarely forgot his lines and turned in several memorable performances towards the end of his career. He was indeed reputed to have had the unique ability to function reasonably well, while under the influence. After a decade long absence, Wilfred made a triumphant return to the stage, first in August Strindberg‘s “The Father”, and then in Joseph Losey‘s 1954 production of “The Wooden Dish”. On screen, he is fondly remembered as the unhinged lighthouse keeper Rolfe Kristan inTower of Terror (1941); as the bearded, slouch-hatted Black George Seagrim in Tom Jones (1963), and as the hilariously pixillated, decrepit butler Peacock in The Wrong Box(1966). By the time he appeared as Peacock, Wilfred’s alcoholism had reached such alarming proportions that he could no longer obtain insurance. Fortunately, this did not deter producer/director Bryan Forbes from keeping him in the cast. Alas, Wilfrid died within five months of the film being released of a heart attack.